I recently bought the book “Build Your Own Off-Road Buggy for as Little as £100” for £8 including postage and shipping from amazon. Overall it was an enjoyable read. I had hoped for more in-depth discussion and details on certain aspects of the kart. The book provided details on building one particular design but didn’t explain why or how to a lot of the details and measurements chosen. 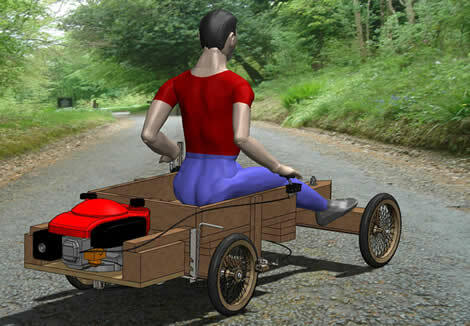 That could well be a good thing for a person making their first kart (or buggy as its called). For you folk working in dollars, 100 UK Pounds = 155 Dollars. After reading the book, and looking at the parts the author used (e.g. the wheels and bearings etc. 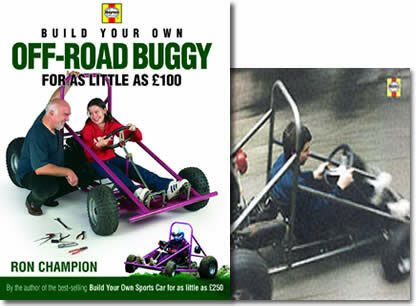 ), it would be a tight stretch to get the whole kart built for £100 or $155. 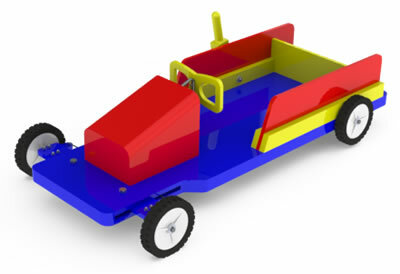 The book is geared towards adults helping them build a kart (buggy). 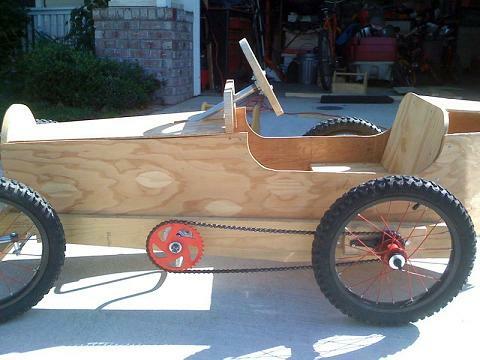 The person building the kart would want a good level of DIY skills. It is also expected that a person obtain a welder either by buying a new or second-hand welder, or hiring one. It was difficult following the text and images in some places, trying to fully understand what is been described and I found myself reading paragraphs three and four times. 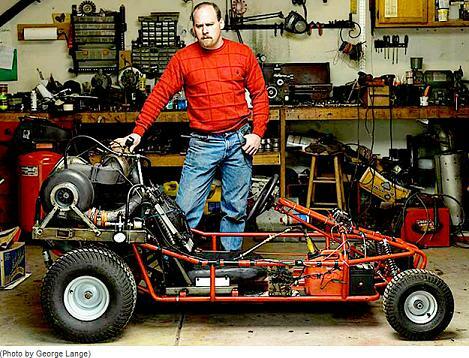 The book was highly relevant to a person confident with DIY skills in building an engine powered go-kart. While it did not explain the “why” of certain angles and details, it provided enough dimensions, that if all followed correctly would work. I did feel that some of the areas were sparse and outside the scope of home workshop capability. One example of this is where a “differential flange” from a ford car was used and modified to act as a hub for mounting the rear wheels. Another flange was then used for the sprocket carrier and brake disc carrier. While this in fact is a very innovative idea and one which I had not considered, modifying one of these differential flanges would require a metalwork lathe and a lot of work. (Of course the option of buying new or old hubs from a go-kart is suggested). 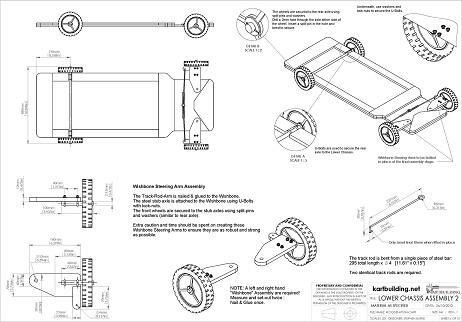 The book which has 90 pages has just enough information and diagrams to build the standard kart. 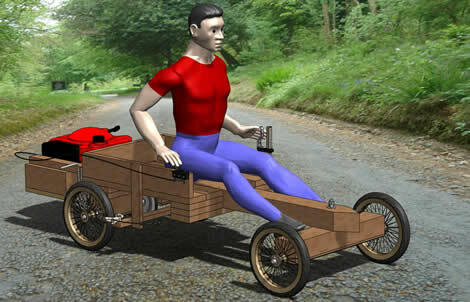 It is clear that the author has made a few of the karts themselves. The author also got a friend to try following the book and building the same kart. I do think a simpler design could have been chosen. The kart chassis has 3 members requiring a pipe bender. I also think the pedal design is poor. Using 5mm flat steel bent into an L shape would in my opinion be insufficient and would bend easily (as the pivot is just a hole in the 5mm steel bar). I prefer using 20mm pipe for the pedals. Information on different places to source parts, materials and engineering services were outlined. 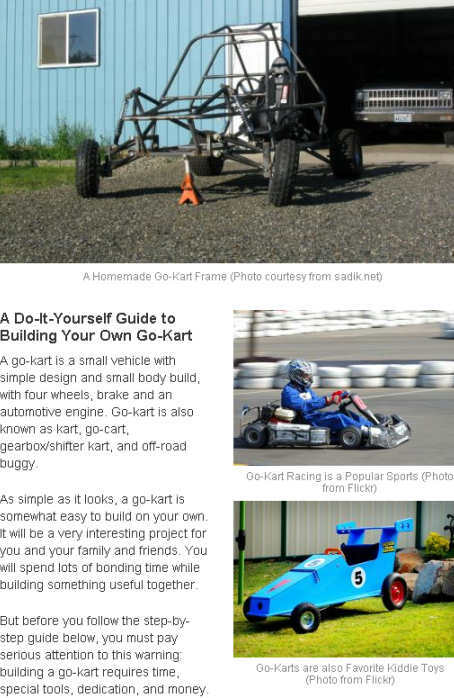 Information on kart safety, safety when building the kart, best places to drive the kart is provided. Loads of information on welding, different types of welding and background information on Gas Welding is detailed. No explanation of certain areas (such as camber, castor and ackermann angles) of building the part is outlined. No set of complete plans, but rather all details were spread out throughout the book. While “alternative solutions” were provided for example track rod ends, no measurements or details of these were given. 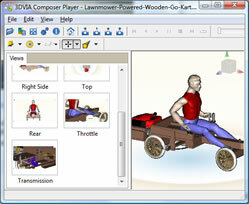 I have previously purchased complete sets of plans for off-road karts and buggies. While I found this book enjoyable, easy to read and informative, I think it didn’t explain enough of the details. I would have also liked to see 15 pages with complete drawings of all components together. 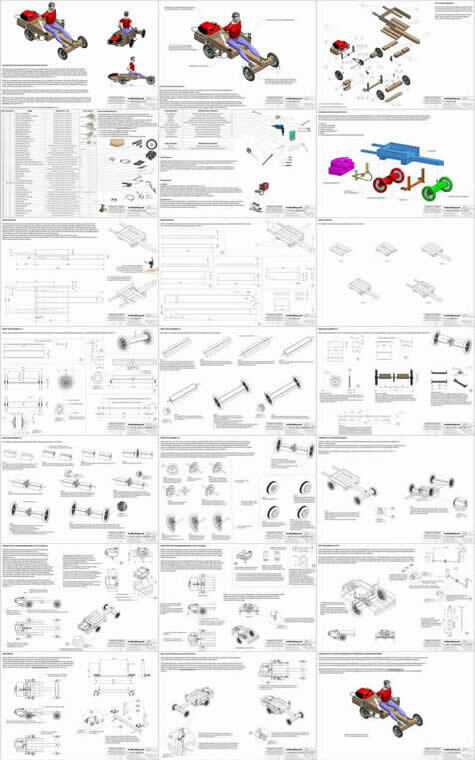 I like to be able to print the 15-20 pages showing the complete set of plans showing all the dimensions together. 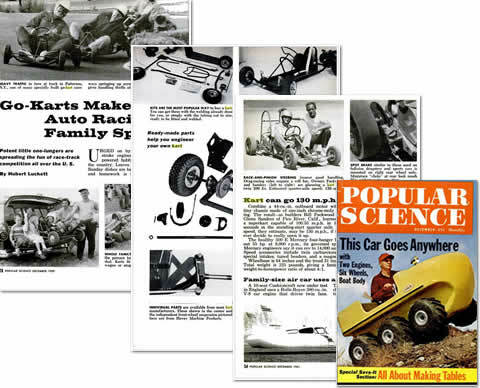 However for £8 it is certainly cheap and well worth a read and will help you make your first go-kart with a motorbike engine.